Size 110=Age(3-4Y): Bust:25.2", Length:15.7", Sleeve:12.9"
Size 120=Age(4-5Y): Bust:26.8", Length:16.9", Sleeve:14.1"
Size 130=Age(6-7Y): Bust:28.8", Length:18.1", Sleeve:15.7"
Size 140=Age(8-9Y): Bust:29.9", Length:19.3", Sleeve:16.5"
Size 150=Age(10-12Y): Bust:30.7", Length:21.2", Sleeve:17.7"
Size 160=Age(13-15Y): Bust:33.0", Length:22.8", Sleeve:19.2"
Material: cotton blended, denim style. Stylish and cute button front design,great to be a Christmas gift. Classic denim jacket,suitable for any casual occasions. Notice: Due to the light and the monitor, pictures may have a slight chromatism problem. 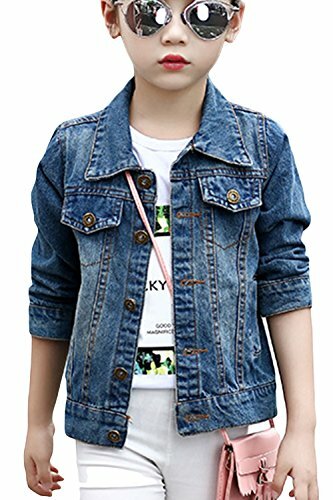 Package Included: 1 x Baby Girl Denim Jacket. If you have any questions about this product by Aulase, contact us by completing and submitting the form below. If you are looking for a specif part number, please include it with your message.